Gt. Ellingham postmill stood in Mill Lane. The mill powered 2 pairs of French burr stones. A SMALL Freehold Estate in good repair in Great Ellingham in the county of Norfolk consisting of a good Dwelling House, Granary, & Stables with an Acre of Land or Pasture Ground to the same belonging, together with a very compleat, strong & substantial Windmill used with & belonging to the said Premises, now in the Tenure or Occupation of Robert Titsale, at the Rent of £15 per Annum. N.B. the said Premises will be sold together or in Parcels. … as also another substantial Windmill in the said county of Norfolk. For further Particulars enquire of Mr. Augustus Caesar Thompson, Attorney at Thetford. The substantial Windmill in the said county of Norfolk referred to above was in fact at Dickleburgh but it is uncertain as to which one. To be Sold by Private Contract And entered upon at Michaelmas day next. A Freehold ESTATE consisting of a Dwelling house with Garden, Outhouses & Premises: also a WINDMILL with good going Geers, all in good repair & condition: also one Acre & a quarter of Arable & Pasture ground contiguous to the same, situate, lying & being in Great Ellingham in the county of Norfolk. For particulars enquire of Thomas Steward of Ellingham aforesaid. A Good Dwelling House, Stable & other Outbuildings, Garden & about an acre of Land in Great Ellingham. Also a substantial WINDMILL standing near the above dwelling house, well situated for trade. The above estate is freehold & possession will be given to a purchaser on the 5th January next. Apply to Mr. Wm. Cockell at Attleburgh. To be Sold by Auction By Mr. Parson At the Bear Inn in Attleborough on Thursday 5 May 1808 between the hours of 4 & 6 in the afternoon. A MESSUAGE in Great Ellingham, Norfolk with stables & other convenient outbuildings in good repair & three acres of land. Also a capital Post Windmill situated for trade now in the occupation of the proprietor, who will give the purchaser immediate possession. The above premises are freehold. Apply to Mr. Wm. Cockell, Solr. Attleborough. A Capital POST WINDMILL with two pair of French stones and going gear complete and a capital Dwelling house and Cottage with barn, stable & outbuildings in good repair and about one acre of arable land adjoining. Also a new Double Cottage with about 2 acres of excellent arable land adjoining. The above are situated in Great Ellingham aforesaid and are all Freehold. Possession of the Dwelling house, Mill & Land may be had at Michaelmas next and of the Cottages at Michaelmas 1821. Part of the Purchase Money may remain on security of the premises. Apply to Mr. Wm. Bowles the proprietor on the Premises. No. 441 House, Cottage & MIll Pasture 1a. 0r. 4p. Apply to James Bacon, Auctioneer & Estate Agent, Attleborough. A capital WINDMILL with Dwelling house & 4 acres of Land in Great Ellingham now in the occupation of Mr. Sayer. Apply to Mr. Joseph Taylor, Bylaugh near Dereham or to Mr. I. O. Taylor, Solr. Norwich. WANTED, a steady Young Man as IMPROVER. Apply to R. Le Grice, Great Ellingham, Attleboro'. 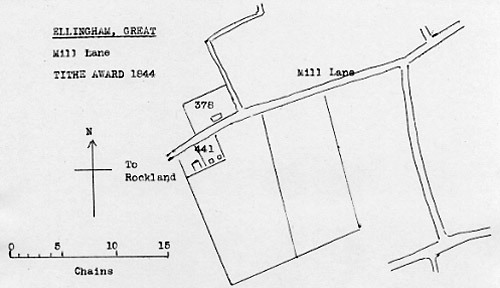 In 1970 Harry Apling recorded that the mill premises were then a ploughted field and that a low ploughed out mound might be the site. A piece of Peak millstone with a semi-circular section furrow was found nearby.